March 22, 2012 Bay Ridge Peace Action held its annual fundraiser party at the Good Shepherd Church on March 22nd. A large crowd of for supporters and friends of that organization got together to enjoy some good food and wonderful music put on by some very accomplished musicians. Matt Weinstein and Ed Goldman of Brooklyn For Peace (Ed is also an organizer for Fort Greene Peace) were honored for their support of the Bay Ridge group. it was a festive and memorable evening. Keep up the good work all of you Bay Ridge peace activists. A special thank you goes to Vicki McFadyen, one of the Bay Ridge group's most active and dedicated members. 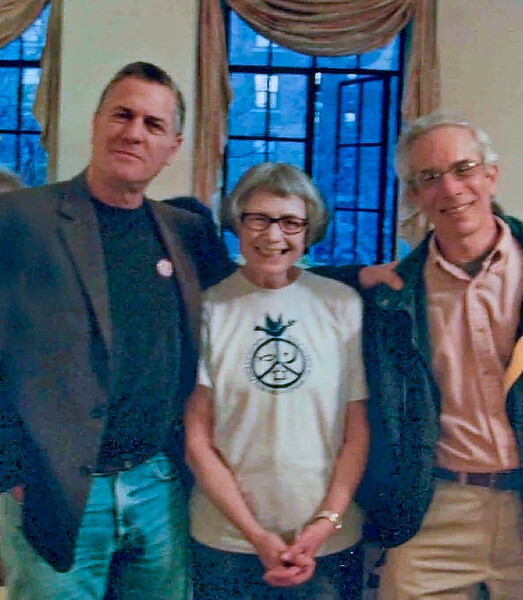 Photos courtesy of Fran M.
Left to right: Matt Weinstein, Vicki McFadyen and Ed Goldman at the Peace Action Bay Ridge annual fundraiser.